If you see cats and kittens who may be abandoned, feral or just lost, please call us at 941-321-1096 to discuss alternatives to help keep these animals from being run over or hurt. We are a no-kill rescue and work toward helping these animals find useful purposes in life. Today our area is faced with an over population of kittens and cats who are abandoned or accidentally left to run free. in many cases too, families are faced with today’s difficult economy and loving pets are being abandoned. Lively Kittens can escape without an owner’s awareness. 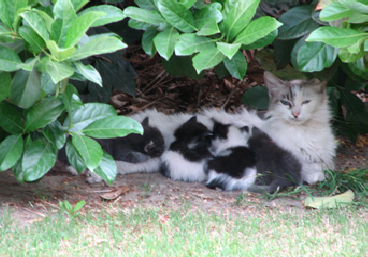 It is difficult for young kittens to survive, lost without their mother and the survival instincts they need. We provide complete search, rescue and trapping services. WE CAN HELP! Many of the young abandoned kittens we find need special care including first being checked by our local veterinary services. We work at eliminating all parasites. We bottle feed if needed, until they are able to handle solid foods. Each animal is given only premium food and we increase their fluid intake with special nutrients added to spring water to help them grow strong and healthy.